The AromaLume fragrance generator is a wonderful new invention from La-Tee-Da. 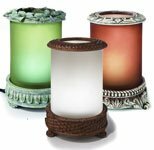 The AromaLume spreads fragrance with no heat or flame. The unit uses a fan and a specially designed wick with an increased surface area along with specially designed fragrances. LED lights in the unit provide a warm and pleasing glow. One bottle of AromaLume fragrance will last 160 hours of use. The unit comes with an AC plug-in adapter, so batteries are not required. Nine different fragrances are currently available. Try an AromaLume today, and you will be amazed at how well it works! One free bottle of fragrance comes with each unit. Please specify which fragrance you prefer in the comments section on the check-out page.